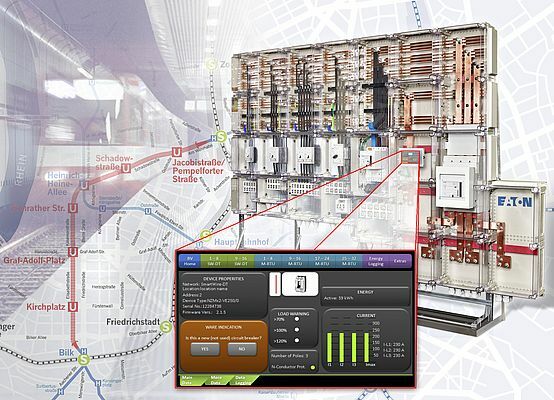 The city of Düsseldorf will use Eaton technology to implement the low-voltage main power distribution systems including intelligent energy monitoring required for the expansion of its city rail network. Over the next two years, five new stations will gradually be completed in the inner city and a new subway line added to the existing network. In all, Eaton will supply eight low-voltage power distribution systems for the stations of the so-called Wehrhahn line, and these will primarily be designed for underground but also partly for above ground installation. "For the city of Düsseldorf, energy efficiency and sustainability were decisive factors in the development of the project," explained Christoph Schink, the Eaton power distribution sales engineer who is handling the project. "The town planners were therefore not only looking for a solution that has been tried and tested in underground rail applications over many years, but also for an intelligent system that allowed the effective monitoring and evaluation of energy consumption and the switching of all loads. We are delighted that we were able to offer a suitable concept using our technologies." Eaton's solution is based on the modular Ci mounting cabinet system, that is particularly ideal for harsh and climatically demanding environments involving extreme temperatures (-40 °C to +80 °C). The Ci insulated enclosures have been designed for fully insulated mounting and are type tested to IEC 60439-1. Each low-voltage power distribution system will be designed with protection class 2 and IP 65 protection, and for a maximum rated operational current Ie of 1,600 A. NZM circuit breakers will be provided with an integrated motor operator for simple switching from the control center between the mains supply and rail electricity. Both the circuit breakers and also all PKE motor-protective circuit breakers, as well as the XMC energy measuring and communication module, are linked together using Eaton's innovative SmartWire-DT connection and communication system. As this not only allows data exchange but also provides the power supply to the connected components, the current consumption of the individual loads can be logged and evaluated without any difficulty. The XMC module makes the relevant measuring data available for calculating energy consumption (phase and N conductor currents, rms voltages, active, reactive and apparent power output, power factor). The brains of the system are implemented in the XV200 HMI/PLC which serves as the PLC, visualization device and operator unit. It evaluates the information and can monitor the operating states of escalators, ticket machines and station lighting systems. Functions can be activated or shut down selectively in the event of an emergency or in order to optimize consumption. The building shells of the tunnel section and the stations are currently under construction. However, the installation of the first low-voltage power distribution system at the Graf-Adolf-Platz station is already planned for the middle of the year. The gradual expansion and integration of the stations with Eaton technology shall be completed by the scheduled commissioning of the Wehrhahn line in 2015.